After I finished this article and published it- I thought, I didn’t do a very good job- because it’s long, and it was missing a one paragraph summary of the actual incident for sharing. I changed the ending and added the short summary the next morning. A competently run school district would be embarrassed by this article. Principals, administrators, and school board members would be resigning, voluntarily, because what happened on Thursday Oct. 12, 2017 isn’t what happens in any school building run by professionals. A teacher was injured on Thursday, Oct 12, at Ponitz Career tech, when students went wild after a pep rally. No students were disciplined or suspended, other than 5 football players who weren’t allowed to play in that weekends game. Two instructors, including the one who was injured, were placed on indefinite paid leave while the district investigates itself. The Ponitz principal was out of the building that day on training. 41 students in the culinary arts program are now without qualified instructors, and haven’t had a teacher in 7 days. One other instructor was placed on indefinite paid leave a week after the incident. No administrators have been held responsible and the board wasn’t informed of the altercation or issues, until 3 hours after a board member was copied in a public records request on Monday, Oct 23rd. by David Esrati, who published a long post and video of the incident on Esrati.com at 11pm that day. That’s standard AP style, which leaves a reader with no true understanding of the depth of the problems in this district under the unprofessional leadership of this board and their chosen rookie superintendent Rhonda Corr. If there are indeed any professionals in this district, or at the State level, or in public office at a higher pay grade, they’d be crawling over this incident with a microscope and making sure that not only do things change, but, that some of the people working in this district, never work in public education again. Policies, procedures, and people- are only as good as an organization expects them to be, and if there ever was a case of low expectations bringing losing results, it’s all there in this story. Yet, there are still a few good people, doing the best they can, working hard to make a difference. Without effective and qualified leadership, they are doomed to fail, they just don’t know it yet. For those who don’t know what Ponitz Career Tech is, it’s Dayton’s second brightest star, after St. Ivers, the school of the arts that has auditions to hand pick and select their student body. I’m not calling it St. Ivers instead of Stivers as a mark of disrespect, it’s just the reality. If every public school could pick and choose their student body, they’d perform a lot better. Stivers is also the cradle of Principals- almost every good principal in the district, got their start as an assistant under Master Principal Erin Dooley. It’s the training ground for our best internal candidates. Ponitz replaced Patterson Career Center downtown, with a slightly different curriculum. Gone are professions like auto-repair and machining, and in are IT and visual communications. Teachers generally feel that Ponitz gets the nice kids, who didn’t make it into Stivers. Five years ago or so, at the last minute, Dayton’s highest paid principal, David White gave practically no notice, and left the district for more money at Trotwood. In a scramble to find an experienced replacement, the district brought in Ray Caruthers from Columbus, where he still lives. Part preacher, part teacher, Caruthers runs a tight ship by most accounts, yet, seems to be absent frequently, often at “training” or other things that keep him in Columbus. He was at CTE training with Dr. Lolli on the day in question. This is not the norm for DPS principals, who mostly are kept in their buildings from dawn to dusk and expected to be in on weekends. Caruthers has two assistant principals and has a third, unofficial principal, which irritates other principals in the district. It’s said, that Wyetta Hayden, the “Chief of School Improvement” has a soft spot for him. They are part of what I call the DPS God Squad, which also includes Associate Superintendent, Student Services Dr. Sheila Burton. On the day in question, once again Caruthers was out of the building. I’ve requested an accounting of his leaves of absences and reasons for being out of the building as part of this investigation. There was to be a pep rally for the Homecoming football game, and then the football players were supposed to have a team meal at 3pm with their coach in the “cafe.” The coach of the Ponitz team is a local legend, Jim Place. Place took over a program that no one wanted, because, well, he feels strongly that he can still make a difference. He runs a program based on personal responsibility and respect. He donates the stipend he gets for coaching into a fund to help build the program. At 70 years old, he doesn’t have to be there. He does it for the love of working with kids who need his help the most. One of the conditions of taking the job, was that he wouldn’t be displacing a younger coach- there were no takers. This year was already getting off to a rough start. Three players had died in a car wreck. Seventeen players were forced to go to different schools as aftermath of the Mark Baker scandal and the Ohio High School Athletic Association being vindictive. He still felt optimistic about his teams chances, despite Belmont dominating the city league this year, and with Dunbar and Thurgood which are always predicted to do well. The Rally had ended and according to multiple sources, the normal process of announcing the clearing of the building wasn’t followed. What happened instead, was several senior football players decided to “play fight”/haze some freshmen. Note- “play fighting” is clearly against the rules and is a “level 3” offense, punishable by suspension. Apparently, not all the students got the memo about “play fighting” and when the theatrics started, some of them jumped in and “real fighting” started happening. This was in the area of the building near the culinary arts program, run by DPS graduate/success story, Chef Anthony Head, who has been trying to elevate the program to that of a chef school- not, training kids to flip chicken at KFC. This year, he hired an assistant, a young lady (who will be known as Chef 2) from the south suburbs, who has a resume of working in event planning, culinary, business development, and is a single mother. Their plan: expose these kids to the best of not only the local culinary circuit- but to take the kids for a 10 day trip to London, Paris, Rome and Florence, and points between. They and their students had been working extra hard to raise money to pay the trips costs, about $4,500 per kid, by the time June rolls in. Their plans for the football game and the homecoming dance were to sell student produced products to raise about $3000. Chef Head and Coach Place were in the cafe next door, when the “fighting” began. Chef 2, heard the screaming, laughing and banging from her classroom, and turned to the student next to her asking what was going on. His response was “this is just what happens, kids act crazy after the pep rallies.” Next, a student steps in and asks Chef 2 to come out into the hall. Another teacher, Lonie Meyer is somewhere in the vicinity. Students had turned to her to ask her to intervene- and suggested that her personal safety was more important- and it was “just play fighting.” Meyer, didn’t do anything. Chef 2, took a look, as three boys were fighting, surrounded by others, and started to scream stop- then made a decision to step in and pull one of the kids off another. The ballet that followed isn’t important, other than to say, one of the kids decided to sucker punch the kid she’d pulled back- and then he decided to run down the hall- with Chef 2 unsnarled in his backpack- dragging her about 20 feet down the hall and causing her injury. We’ve obtained a student shot video – which shows Chef 2 being dragged. It also shows a building seriously out of control. Here comes the question? Was dragging a teacher down the hall “assault” or an “accident?” Only in DPS would this question be an issue. Anywhere else, if a student doesn’t follow a teachers verbal instruction to stop, be it fighting, running, or anything else, they’re in enough trouble. At DPS, we’re going to quibble over “intention.” Only because we don’t know what a safe school environment is. Her elbow has a massive bruise, she’s sprained her thumb- on her cutting hand, her foot has rug burn- and her stilleto heel had the paint peeled off. Note, I don’t care if you are superman, if you can’t tell you’re dragging a 5’7″ person twenty feet down the hall who is screaming- while you’re running, you deserve to be suspended and probably charged with a crime. You’re wondering why was a chef in stilettos in the building? That day, her and Chef Head had been out on training- and weren’t even supposed to be in the building, they’d had a sub to cover their lesson plans, they only came back because of the fundraiser. Dedication- something surely not to be recognized or rewarded for in Rhonda Corr’s house of horrors. Chef Head finds out that Chef 2 has been hurt, he goes to the office to find out what’s being done. This comes down to a he-said/she-said, but. a competent investigator should be able to piece this all together. My sources say that the two assistant principals, Debra Corbin and Julie Nighswander are watching the video- and laughing. Head asks what they plan to do, others filter in, including Meyer, who was an eyewitness. Words are exchanged between Head and Meyer- who, and I can’t make this up, starts to pull her shirt off, as if to fight, which, considering she was afraid to intervene when the students were fighting- makes for a really questionable storyline. One may ask, where were the building Safety Resource Officers during all this? Supposedly, outside supervising the dismissal, but both came back in to deal with things- after the students involved had all scattered. They too, wanted to watch the tape. In an instant replay world, nothing seems to count without video evidence. All requests for DPS security video by this reporter get denied, citing privacy issues. Students have been threatened with suspension for sharing any video they shot with their own phones. If this administration wants to target citizen journalists for shedding light on the criminal conditions in their schools, be it known in advance, I, along with every lawyer I know in town, will come out in defense of the students. In the span of 15 minutes, many people have been woven into the story- DEA building Rep Nan Wingrove, has made her way into the culinary classroom- she advises Chef 2 to start writing her statement. She’s in the process of doing that, when she’s called back to the office. Ten weeks into her new profession, and being called to the office. Not exactly the kind of experience a young optimist out to change the world for some inner city kids wants. But, hey, let’s be real, DPS in its constant churn of teachers and administrators through the fraudulent shell organization that they call a school district, doesn’t really have an onboarding system. She’d been to a total of three days of prep- before being thrust into “Stand and Deliver” high. Only this time, the principal isn’t there, just two assistants. Debra Corbin started as an assistant principal at Stivers 11 years ago. She’s the only one of her “class” of Dooley, that is still an assistant, not moving up. Others from her era, David Lawrence, Lisa Keene, all have had their own buildings for years. It’s not that hard to move up in DPS since so many move on. Corbin also has a connection to Lonie Meyer- she’s the god mother of Meyer’s kid. The other assistant, was promoted after former Assistant Principal Nelson Stone was tapped to take over Dayton Boys Prep – because Master Principal Horace Lovelace decided he’d had enough. Julie Nighswander couldn’t seem to get the story straight, depending on information from Meyer. She had heard a girl got dragged down the hall- when she confronted Chef 2 about the incident, not realizing Chef 2 was the victim. When they got back into the office, somehow miraculously, Latoya Harper is there from the central office, H.R. Ms Harper’s appearance is extra special, because Chef 2 had been putting calls into her since school started, over some issues of her classification. Harper, on the other hand, who has fancy letterhead where her name is bigger than the line “DAYTON PUBLIC SCHOOLS” in the logo, is all business- and is there to make sure Chef Head and Chef 2 are not going to be in the building on Friday. Both are put on admin leave with pay. This brings up the question on how many staff are currently on paid admin leave in the district (that public records request was filed today). The only problem is the culinary program, with 41 kids, doesn’t have any other qualified instructors to step in and take their places. As part of their training and qualifications, the students must complete 200 hours in both their junior and senior years to graduate and to keep the program legit. 7 days have passed, and nothing has been done. I have video from kids showing the empty classroom- complaining that they’ve been without a teacher. I don’t want any of them to get in trouble, so I’m not posting it- but, I have it, for any investigators from outside the district. The district has assigned their head of security, Jamie Bullens to complete an investigation. This in itself is of questionable value, since Bullen’s own employees are part of the incident. Finding fault with them, would reflect poorly on him. An unbiased and actionable report by him is unattainable. Neither of the two laid off employees have been interviewed yet, despite assurances by Harper that Chef 2 would have been contacted last Monday. 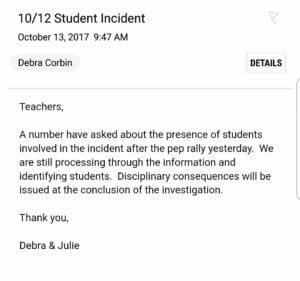 A number have asked about the presence of students involved in the incident after the pep rally yesterday. We are still processing through the information and identifying students. Disciplinary consequences will be issued at the conclusion of the investigation. Again, this is not policy. The punishment for fighting, is immediate suspension. Even “Play fighting” is against the rules. The only immediate discipline, is to the chef who tried to stop the fight and got hurt, and to her supervisor who questioned their inaction. Wait, I take that back. Coach Jim Place, reviewed the video, and then had his four assistant coaches review it, and they came up with lists of who threw punches. Five players were not allowed to play the following night, with one being suspended for 2 games. Another, who was said to be involved by others, scored a touchdown that Friday night. Once again, DPS Athletics where rules are flexible. Since I was first made aware of this last week, I’ve spent over a dozen hours interviewing people from the school, administrators and even former DPS personnel who are familiar with process and procedure. All concur, this is an epic fail on many counts. I sent a public records request at 12:51 PM today. I copied district counsel Jyllian Bradshaw, DEA leader David Romick and for good measure a board member, just to make sure it wasn’t hushed under a rug. By 3:30 Corr had responded via Cherise Kidd with a message that everything was being investigated, and that a public records request from a local blogger was mostly ungrounded or privileged info. This was the first the board had been informed of this incident. I am requesting all documentation and investigation of an incident at Ponitz Career Tech that took place on Oct. 12 2017. I would like to see the statements that were given by all staff and students ASAP- and investigation reports when completed. I understand you still believe that surveillance video in the building somehow is exempt from public records, which I still believe to be an incorrect position, and would ask for it as well. I’d like a list of all students suspended from this incident. Since a teacher was injured due to the actions of a student- I’d like to know which school the student was transferred to?? I’d also like to know what training and onboarding processes the district provided Chef 2 who is currently suspended. I’d also like proof that Chef 2 has been paid in a timely manner by the district. and, reasons for him not being in the building on other days since his hiring. It has come to my attention that he is frequently not in the building for various reasons. Lastly, I’d like to know who has been hired in the interim, to teach the students in the culinary arts program, since you’ve suspended both instructors, and how the students will meet their hourly training goals this year in light of your actions. I expect this to be answered by EOB today- since these students shouldn’t be penalized for the districts incompetence. Of course, no response to my request was forthcoming. The real test will be if there will be qualified instructors in the culinary arts program tomorrow. The other question is how long will this board wait, to call a special meeting to evaluate the Superintendent’s fitness to lead this district. That this wasn’t brought to the boards attention before “a local blogger” made a request is proof that this superintendent has nothing but disrespect for the board. Also, that someone is covering for the failures in leadership at Ponitz. If there is a lesson to be learned, DPS isn’t doing itself any favors promoting principals to be HR chiefs. Human resources is a totally different career field than being a principal, with federal and state laws, a plethora of non-educational rules and regulations as well as training programs. Sure, there are education specific licensure and training issues, but, the fact that we’ve failed to properly train and mentor new teachers is clearly demonstrated by this incident. Competent leadership, would have replaced the people who were in charge when the school turned into a zoo. This kind of behavior in a public school is unacceptable at any time. This is the type of situation where the board should be kept up to date and in the loop. The fact that they were kept in the dark, is just one more indication that the district needs new leadership. Only in DPS under Rhonda Corr and this board, would anyone think this is remotely acceptable in a school. I’ll go ahead and provide these explanations, since I don’t expect the current DPS to do their job. The information you request regarding students is not public. The school district is forbidden by the Federal Family Education Rights to Privacy Act (FERPA) from making available any infomation about students unless permission to do so is formally granted by the student’s parent or guardian. Moreover, professional ethics for journalists have traditionally specified that names of minor offenders are not to be published. The information requested about internal matters regarding staff and administration is covered by labor law. Details currently in personnel files and employment status are available to the public and those requests should be fulfilled.